The month of April is observed in the United States as the National Distracted Driving Awareness Month. Despite numerous awareness campaigns and initiatives taken up by the US government nationally and by organizations like Shreya Foundation (www.shreyadixit.org) at the community level, the number of fatalities on our roadways keep rising like a high tide. Preliminary data on first six months of 2016 published by National Highway Traffic Safety Administration (www.nhtsa.gov). It was the largest rise in traffic fatalities since 1996. Traffic related deaths in the US rose 10.4 percent compared to the same period in 2015. The number stood at 17,775 people dead from motor vehicle crashes, and that only in the first half of this year. Over the same period in 2015, there were 16,100 reported fatalities. Some attribute the above fatalities to an increase in driving time spent on the roads. Americans racked up 1.58 trillion miles in the first half of 2016. This is 3.3 percent above the 2015 numbers. But I want to take these numbers with a grain of salt. I would go beyond the myopic view of the number of miles driven, and expand the perspective by examining other deadly factors that possibly are in play. Of course, cell phone is at the top of list. A recent National Safety Council opinion poll in which 82 percent of Americans stated that cell phones are an addiction. I agree. Debbie Hersman, the CEO of National Safety Council, in a recent post wrote that “…addiction is relatively harmless when we’re using our phones to talk or surf the web from our couches. But when we’re behind the wheel, our addiction can be lethal…”, so true. We humans respond to the ring of a cell phone just like a dog jumps with raised ears at the drop of a pin. With no offence to the poor dog, we are better than a dog. Let us not be so driven by our cell phones that it forces to surrender to this inanimate object. Let us pause and think. This benign attachment has the potential to turn into a life-threatening situation in a split second. However, simple activities eating/drinking, interacting with a navigation system, changing radio channels, flipping through CDs etc. while driving do qualify as distracting tasks. Some of the not so simple things that we seem to undertake are: tending to a cranky child in the back seat, getting into spirited discussions with co-passengers or worse with someone on the other side of the phone line or attending office meetings. I have seen drivers surfing the web, snapchatting, watching Netflix, and I am not exaggerating. Realistically stating, we are intelligent enough to be able to manage little bit of disturbance while driving but we cannot forget that as a driver our primary task is still driving. Let us not fall prey to the myth of multitasking. Experts have proven with research that our bodies are not designed for multitasking. 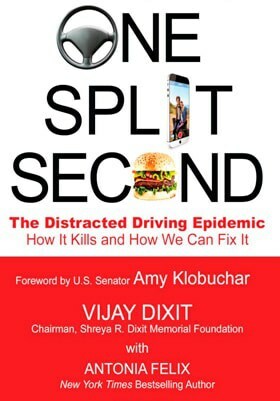 I encourage examining the end to end picture of distracted driving, from problem to solution. Let us patiently tackle them through a three-pronged attack strategy. It entails the simultaneous deployment of the instruments of education, legislation and technology. Focusing on just one will not help. The Shreya Foundation is dedicated to all three by technology leveraged education of drivers of all ages at the grass roots level. We collaborate with state/federal legislators and safety advocacy groups for enacting intelligent laws to combat distracted driving. Current example of such collaboration is the new hands free bill under consideration by the Minnesota legislators (HF 1180). I urge readers to please contact their own representatives and senators to support this legislation authored by Rep. Mark Uglem and Rep. Frank Hornstein. It will ban the use of hand held devices. However, the proposed legislation will allow the use of Bluetooth devices and cell phones on a fixed harness. Let us save lives as a team and remember that driving is not a contact sport. Treat it with respect. Drive distraction-free.